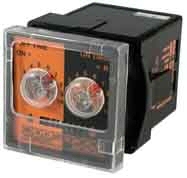 The Automatic Timing and Control ( ATC ) 422AR is a repeat cycle timer packaged in an 1/16 DIN housing with an 8-pin octal base for plug-in or panel mounting. On and Off times can be independently adjusted from 1 Sec. to 10 Hrs. The ATC 422AR FLIP-FLOP is available with Repeat Cycle operation. During Repeat Cycle operation the ATC 422AR cycles ON and OFF repeatedly, allowing periodic cycling of a load. Two knobs are available to individually adjust the ON-time and the OFF-time. The 422AR can be configured with either the relay being energized during the first timing period or de-energized during the first timing period. The ATC 422 FLIP-FLOP has six selectable timing ranges for the ON-time period and 6 selectable ranges for the OFF-time period. The ranges are 1 and 10 SEC/MIN/HRS. This ATC TDR has universal voltage input, 12-240vdc and 20-240 VAC with 10 amp contacts. The ATC 422 uses the 8 PIN (Octal) socket common on most small TDR's. (Use p/n 8258500 for surface/DIN rail socket). This ATC TDR is UL and CE approved. The ATC p/n is 422AR100S0X. Click here to return to the full list of ATC Timers.